All transactions are safe and secure with a reliable history in online purchasing behind each of our associates. 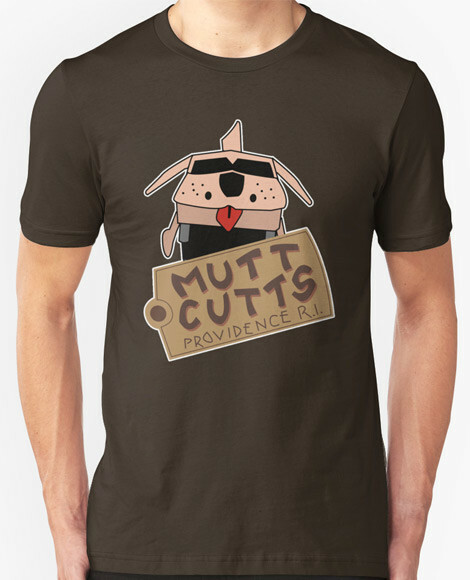 Buy the Mutt Cutts t-shirt to own Dumb and Dumber clothing and merchandise. Harry dedicated his life to Mutt Cutts. He even went as far as decking out his van in brown shag carpeting to look like a sheepdog. Show your devotion to the movie with this Dumb and Dumber Mutt Cutts t-shirt featuring the Mutt Cutts logo he proudly displayed on the side of the Shaggin' Wagon. If you love his shaggy Mutt Cutts van, be sure to check out the Dumb and Dumber Shaggin' Wagon t-shirt featured in the gallery along with the other Dumb and Dumber t-shirts. In addition to the Mutt Cutts tee above, browse the Dumb and Dumber Clothing Gallery for more apparel like men's and women's clothes, kids shirts or hoodies.